​So did the rain. Luckily we had purchased a few ponchos from our rainy days in Williamsburg and we were committed, rain or shine. 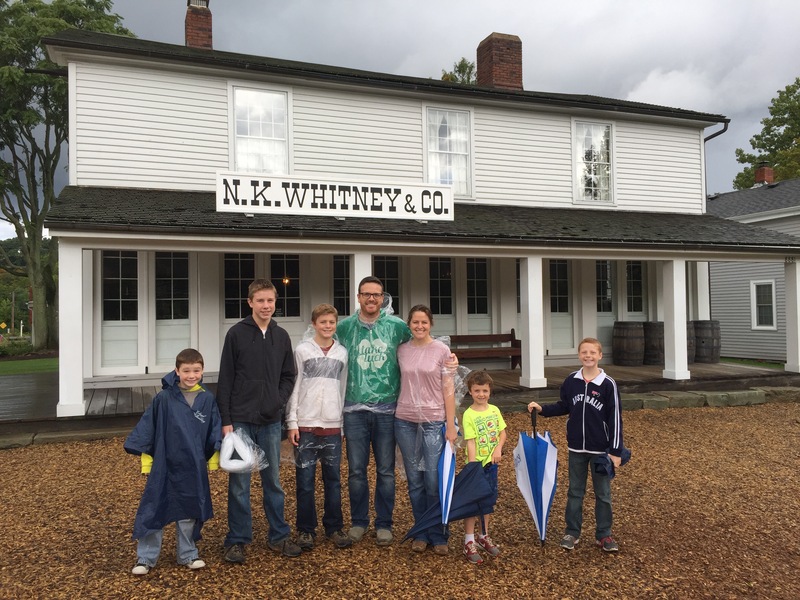 The Newell K. Whitney store was a very significant place in early church history. Joseph and Emma Smith lived there and many revelations were received there. The room in the picture above was a sacred room, simple as it was, called the school of the prophets. The saints, most of them poor, were asked to build a temple. They didn’t know how to accomplish such a huge undertaking. As they exercised faith, Heavenly Father provided them with direction or people who could help. The pictures above represent that. A miller moving into town who could build a saw mill to be used entirely for the temple and the ashery, a profitable company whose proceeds were all consecrated to the church and the funding of the temple. We went to a local shop for lunch and while we waited (and waited) we took pictures of some of our clubs. Max and I are in the forehead-with-major-wrinkles club where I was informed by one of my beloveds that my wrinkles are still there even when I don’t try. On the flip side, Dave Simon and Jack are in the 3 forehead-wrinkles-or-less club AND the two-at-a-time brow-raise club. Max, Ollie and Burton and I can raise one eyebrow at a time and all of us can do the lip curl… to some degree. I almost forgot to mention that one of the sister missionaries invited the kids to try a hot pepper growing in one of the gardens. They all did and were cool and confident until it hit them. Relief couldn’t come fast enough and some tears may have been shed. The sun started to come out and now it was time to see the inside of the Kirtland temple, which I’m so glad we did. It is not owned by The Church of Jesus Christ of Latter-Day Saints so we went to a separate visitors center and were then directed through the temple. It was huge. I had no idea, not even from seeing it in person on the outside, that it was so large and impressive. I didn’t know it had three levels. I loved being there. Throughout the day I couldn’t help but think of all that was asked of these people and all of their hardships that they met with pure faith and unselfishness. On the way out-of-town we stopped at the Morley Farm where we learned again of incredible commitment to the Lord, no matter what. We also learned of a small log cabin school-house on the farm that was used for the 4th general conference and was a sacred building. No doubt the early saints were too busy consecrating, building, serving, and sometimes just surviving to imagine the influence of their faith in action. I was grateful to be there with my family and to improve my appreciation for how the prophet and the saints lived during the establishing years of the church.